WASHINGTON (Jan. 17, 2003) -- Some of the Air Force's sharpest airmen are helping the Pentagon make a good first impression. They are part of the Pentagon tour program, showcasing the building, its people and its history for visitors from around the world. Its purpose, said the noncommissioned officer in charge of the program's 35 members, is to give the public an inside look at the Department of Defense. Airman 1st Class Robert Green, Air Force Honor Guard, conducts a walking tour of the Pentagon. Green is one of 35 military professionals selected by their respective service as being the best of the best amongst the National Capital Region’s military ceremonial units. These elite individuals conduct the Pentagon tour program - showcasing for visitors the very heart of the United States Department of Defense. "This is an outreach program," said Master Sgt. Kenneth Williams. "We reach out to the public to show them the Department of Defense, some of the history of this building and also what we do here day to day." Secretary of Defense Donald Rumsfeld started the Pentagon tour program during his first term in office in 1976. It uses enlisted members from all four armed services and the U.S. Coast Guard. The Air Force chooses its representatives for the program from the Air Force Honor Guard at Bolling Air Force Base, D.C.
Airman 1st Class Robert Green is one honor guard member chosen from among his peers to represent the Air Force at the Pentagon. 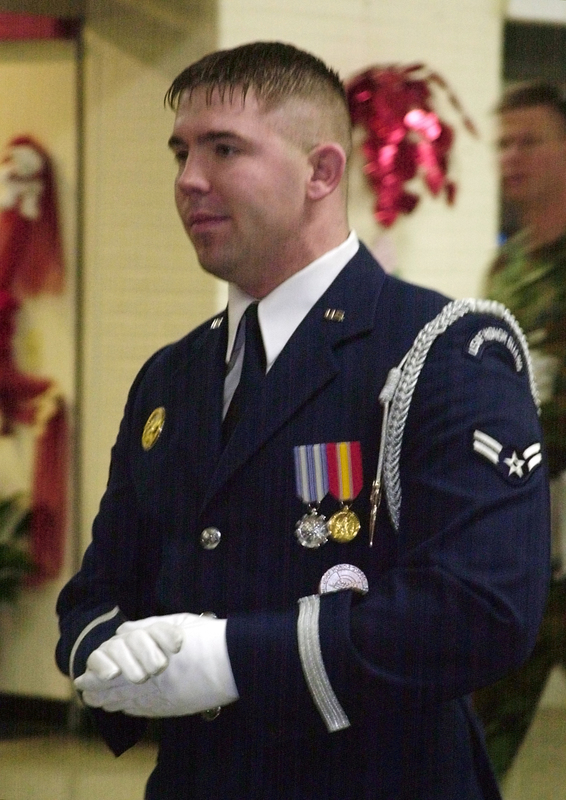 Green, who like other airmen in the program remains a member of the Air Force Honor Guard, served at Bolling AFB for two years before he was chosen for Pentagon duty. That time, he said, was spent perfecting his craft. "I was actually a (pallbearer) for two years," Green said. "I carried caskets in Arlington cemetery. When I was at the top of the element for (pallbearers), I submitted an application for Pentagon tour duty." Williams said such a career progression is typical of those who come to work for him. "You have to be a member of your service's honor guard first," Williams said. "Normally you are chosen after you demonstrate superiority in performance of your specialty. Most of our troop's specialty is fire party, pallbearer or a colors troop -- those that carry our nation's colors. Once they have risen to the top of their specialty in their honor guard, we have them apply here." Being the best of the best is important, because as a Pentagon tour guide, there are more than just other military members to look good for, Green said. "You have to be pretty straight-edged. They are not just going to send anybody over here," Green said. "For a lot of people who receive these tours, this is their first image of the military." Becoming a tour guide at the Pentagon requires a two-week training course. Part of that involves the memorization of a nearly 30-page script that details the mission of the DOD, the missions of the services and items of interest at the Pentagon. 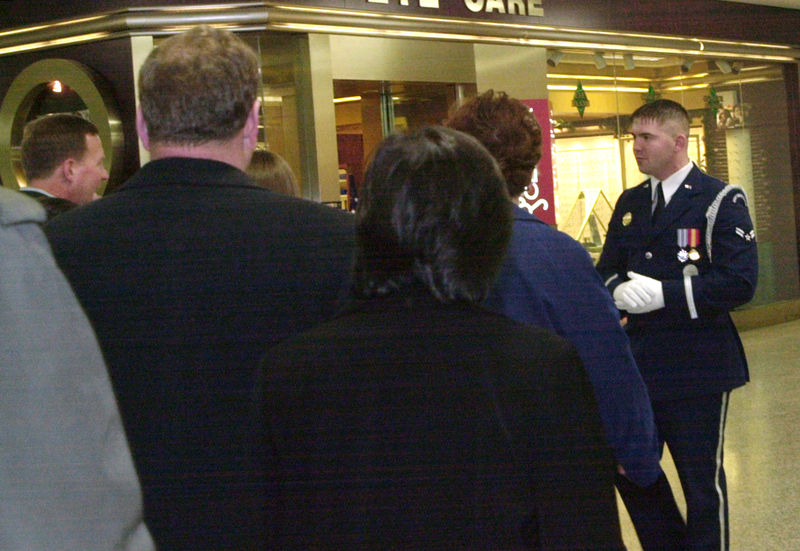 A common sight in the Pentagon halls is that of a tour guide in training, reading the 90-minute narration to an imaginary group of tourists. Making the one-and-a-half-mile tour route all the more difficult is the fact that the guides walk the tour backward so they are facing their tour group. Airman 1st Class Robert Green, Air Force Honor Guard, is one of 35 military professionals selected by their respective service as being the best of the best amongst the National Capital Region’s military ceremonial units. These elite individuals conduct the Pentagon tour program - showcasing for visitors the very heart of the United States Department of Defense. "I recorded my voice onto a tape and fell asleep to that script," Green said, explaining how he memorized the words. "I actually slept with headphones on." After guides pass their final exam, having shown they know the official script, they are allowed to personalize their tour. "A lot of them are proud of their own branch of service, so a lot of times they take a lot of pride once they get to whatever corridor their branch of service is in," Williams said. "We don't mind them ad-libbing somewhat." The guides must also do a little preparation on their own to answer the barrage of questions from visitors. "They ask how many rolls of toilet paper are used in the building each day, or how many light bulbs there are -- all kinds of factual stuff," said Senior Airman Carlos Centeno, a one-year veteran with the program. "As a result, we end up doing a lot of research on our own." However, giving tours is not all trivia. Green and Centeno explained that tour guides must set the tone before the tour passes through the security checkpoints at the entrance to the building. "We tell them how to line up and where they need to stand," Centeno said. "We give a lot of direction." Green said it is all in the name of security awareness, as well as decorum. "We want to get their attention," Green said. "This is the Pentagon, a federal office building. We want to let them know that before they come in, so they are (respectful) as we go through the executive corridors." Since Sept. 11, 2001, the general public is no longer offered tours of the Pentagon. But schools, educational institutions and other select organizations can arrange tours by calling the Pentagon Tour Office at (703) 695-1776.